When your home needs a fresh coat of paint or a new color entirely, it can truly be a project worth getting excited about. It’s a great way to make your home stand out in the neighborhood and express yourself to your friends and neighbors. However, many do-it-yourself painters will attempt a project like this but make many mistakes along the way. 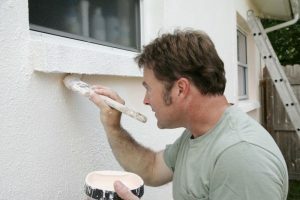 To avoid doing more work than is needed and get your exterior painting done right the first time, consider these four mistakes amateur painters make on a regular basis. We’ll help you avoid them in the future. When painting your exterior, many homeowners will rush the process without laying down proper protection beforehand. If you don’t lay down the right protection around specific areas of your home, such as light fixtures, outdoor outlets, plants, bushes, mulch, gravel, columns, windowsills or fences, you run the risk of splattering, dripping and spilling paint on them during your paint job. For proper coverage, use painters tape and plastic to cover areas you don’t want splattered. Canvas mats are ideal for catching paint and preventing it from dripping on your home’s foundation. You can also use tarps to cover plants or bushes, just make sure to remove them when you’re finished to prevent smothering. Remember, no matter what home improvement project you’re doing, preparation is a key step to always consider. When you’re painting large areas like your home’s exterior, the last thing you want to do is make mistakes that take up a lot of space. For example, when starting your paint job, you may notice that paint is going to drip or run down as you progress. That’s why it’s essential that you start from the roof of your home and work your way down, not the other way around. It’s important to correct splashes and drips quickly by rolling them with a paint roller or quickly brushing them smooth. If you don’t, they’ll dry this way and new paint will not be able to cover them up. Don’t Wait for Failing Paint! Just like the painter that rushes the job and doesn’t put down proper protection, another common mistake is not removing failing paint before applying a new coat. If you notice paint that’s chipping or peeling off, it’s going to require more preparation before a new coat can be applied. To avoid this, make a thorough examination of your entire home’s exterior to look for failing paint. The last thing you want to do is wait too long to start your exterior paint job. Don’t be afraid to contact a professional if you’re unsure of the best way to start your paint job. The best way to avoid messing it up in the beginning is to have a painting professional help you prepare surfaces, provide coverage, apply exterior paint or simply provide an estimate! Want a professional opinion before starting your paint job? Schedule a consultation with a painting company today! The experts at Platinum Painting focus exclusively on residential homes when it comes to interior and exterior painting. That means you’ll get the most informed opinion and valuable advice before starting your next DIY project. For an extra set of hands and a professional’s touch, contact our office today for a free quote!